From December 1st - December 15th for every 1000 Kafra Points spent, any RO1 or RESTART account will receive one Costume: Shining Santa Poring! When equipped, EXP increases by 25% when defeating monsters during December 2017. Drops increases by 15% when defeating monsters during December 2017. Q: Can I get Multiple Hats? Q: When will you distribute? A: Every Maintenance for the sales ending at the midnight before until the event ends. Just 100% on kerrots? Can we make it 2017%? if you spent 10k kp, do you also get 10 pcs of those costumes or just 1 every maintenance after midnight? The keyword is for every 1k and multiple hats. So yeah you will get a bulk of those. but by wearing goggles, you will looked like every digimon main character. The rate is TOO LOW. The original HP heal of a carrot is 18 ~ 20. Edited by flynight, 03 December 2017 - 10:41 PM. costume boys cap is cool. Where is it going to be sent to? inventory? storage? You can pick up the item from the NPC Code the Redeemer, found in Eden second floor by the stairs. 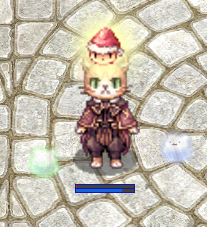 First batch of Santa Poring hats have been inserted. We'll be distributing another batch next Thursday after maintenance. I have bought 1000 KP and spent it in Kshop. But Code the redeemer still show me empty option. What's wrong? What else should I do to obtain Cristmas hat? Edited by Caoilainn, 10 December 2017 - 06:31 AM. Code the redeemer shows empty options for me as well. what shall i do? About to do today's insert. So I just go to code redeemer and I can get one, recently spent about $15 on the 14th. Is it possible to still pick up? is the latest batch in? The last batch should be going in today.